Google’s Chromecast peripheral only debuted a couple of weeks ago, but with its cheap price and emergence as a relatively hackable product, many consumers have jumped on board. For $35, the receiver lets you stream content from any device to your HDTV, but at this point, limitations mean that only a handful of video and audio services are currently compatible. Thus, some have opted not to pick up the Chromecast, and if you’re one of those individuals holding off for the time being, you might be tempted by CheapCast, an app that can turn your Android device into a makeshift Chromecast receiver. Of course, considering the real thing costs less than pretty much any other set-top box-like contraption out there, perhaps the app should be called VeryCheapCast. But then again, nothing beats free, and if you have an Android device sitting around and doing not very much, the app will help your trusted spare get its moment in the sun once more. 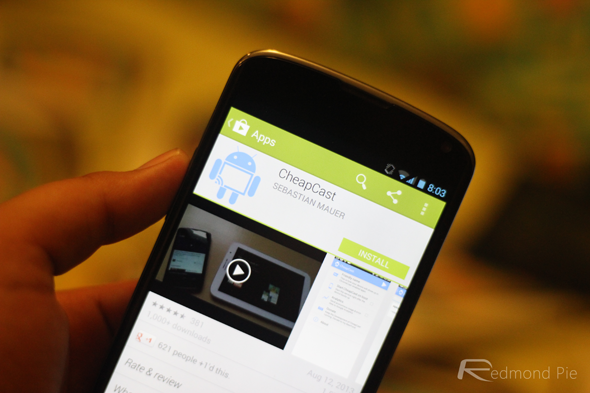 CheapCast arrives courtesy of XDA-Developers member Maui, and turns just about any Android device into a Chromecast receiver. Since the real thing doesn’t actually do a great deal – as critics have been quick to point out – the app is thus rather simple. Once downloaded, you fire it up, set a name for your mock receiver, and from there, you’re essentially ready to go. It may be called CheapCast, but it doesn’t operate like the poor man’s version it purports to be. In fact, it works just as the real Chromecast receiver does, but although many users are still yearning for support outside of Netflix, Google Play et al, CheapCast does share the unwanted trait of limited compatibility with its legitimate counterpart. CheapCast is still in beta, and with no current support for Google Cast tab streaming in Chrome, let’s hope, when it does crawl out of beta, that this functionality will be present. 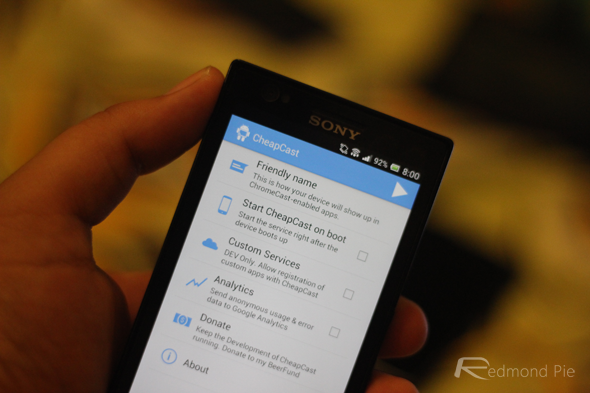 You can download CheapCast right now from the Google Play Store, and if you encounter any difficulties, be sure to check out the original forum thread over on XDA.